China Graduate School of Theology Study Bible, Nanjing 2000. Early Christian documents. China Christian Association Press 2003. Shanghai. Includes 1 Clement, Didache, etc. The Apocrypha. Beijing Commercial Press 2004, translated from the English, Good News with Deuterocanonicals 1985.
or CLC, 2F, 49 Carnavon Rd, Hong Kong 852-27231578 Lion Bible Mapbook 1985, Oxford. Chinese edition by Cross Communications Nathan Rd., Hong Kong. Third edition 1996.
see online version Josh McDowell, Evidence that demands a verdict 1972 Campus Crusade for Christ, CA. 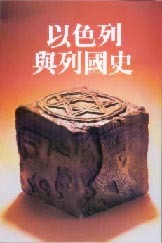 Chinese edition by Christian Renewal Taipei 1978. F.F.Bruce Israel and the Nation: from the Exodus to the Fall [of the Second Temple]. F.B.Meyer Bible biographies. 14 in series Abraham to Paul. Chinese edition Living Streams, USA.